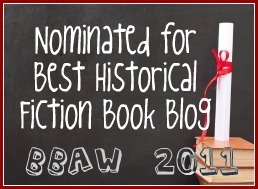 Have you written a wrap up post for the 2013 Historical Fiction Reading challenge? If yes, then leave the link to your post in Mr Linky below. Thanks to everyone who made the challenge such a success this year, and we look forward to you joining us again next year! Thanks for hosting a brilliant reading challenge again this year, I thoroughly enjoyed it. I signed up to read 10 but ended up reading 14 novels for the challenge. I've signed up for 2014 to read 15, so that should push me a little further. Thanks again! I linked to more books than I signed up for, so am happy about that :) My wrap up post is actually wrapping up on 3 challenges, so scroll down to find my HT wrap up. Happy new year 2014 from Carolyn - 'RIEDEL Fascination'! I wonder if you recall my questions and observation at the beginning of the year. Except a couple of books without being aware of the heading, I had never read 'historical fiction' **until you**. :) You might remember having to explain which decade begins to qualify as historical! Even with films, I worry that period entertainment might be dry or hoity toity. I'm pleased to tell you I love it. I'm now I Kate Kingsbury fan and will re-join you next year to finish with Susan Wittig Albert and start much, much more.